Yadav Tours And Travels reserves the right to change the terms, conditions and notices under which the Services are offered through the Website, including but not limited to the charges for the Services provided through the Website. The User shall be responsible for regularly reviewing these terms and conditions. The courts of Delhi shall have the sole and exclusive jurisdiction in respect of any matters arising from the use of the services offered by Yadav Tours And Travels or the agreement or arrangement between Yadav Tours And Travels and the Customer. 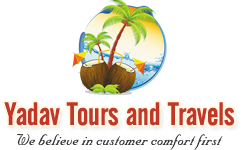 Yadav Tours And Travels is committed to ensuring that your privacy is protected. Should we ask you to provide certain information by which you can be identified when using this website, then you can be assured that it will only be used in accordance with this privacy statement. Yadav Tours And Travels may change this policy from time to time by updating this page. You should check this page from time to time to ensure that you are happy with any changes. The Website may contain links to other websites ("Linked Sites"). The Linked Sites are not under the control of Yadav Tours And Travels or the Website and Yadav Tours And Travels is not responsible for the contents of any Linked Site, including without limitation any link contained in a Linked Site, or any changes or updates to a Linked Site. All rental payments are to be made by Cash or Bank Transfers. Any delay due to unavoidable circumstances like bandh, traffic jam, breakdown, accidents, severe weather conditions etc Yadav Tours And Travels is not held responsible. If the payment on the credit card / Debit Card / Net Banking is declined / Failed for some reason, for alternate payment instructions you must call in Yadav Tours And Travels, 72 hours prior to the time of departure, else the order is liable to be cancelled. Sometimes Online Making Payment Through Our Websites it takes 24 hours to 36 hours To Reflect Amount in Our Account and We Cannot Confirm or Provide any Services unless we received amount. All rental payments are to be made by Cash / Bank Transfers / Net Banking / Credit Card / Debit Card. Please take care of the belongings before leaving the cab / Hotels and Yadav Tours And Travels is not responsible for any loss. Please read carefully and understand the contents of the Tour Brochure / itinerary, the 'Terms and Conditions', Price Grid and such other documents as may be applicable, as all these will form part of your contract with us once you effect the booking. Carry Your Valid ID Proofs / Passport etc While Travel / Hotel Checkin Time. Yadav Tours And Travels Not Responsible For Any Client ID Proof Related Issues. Transaction Confirmation You should not take any action based on information on the Website until you have received a confirmation of your transaction. In case of confirmations to be received by email, if you do not receive a confirmation of your purchase/transaction within the stipulated time period, first look into your "spam" or "junk" folder to verify that it has not been misdirected, and if still not found, please contact our call centre. Health : It is presumed that the tourists who have booked the tour have gone through the itinerary & is well aware about the same. It is presumed that the tourist is medically fit to undertake the said tour. The person who is medically fit to undertake the said tours shall join the said tour. The persons who are and/ or who have suffered from any ailments for which they have taken medical treatment have gone into check up hospitalization, shall not join the said tour. Many a times a tour manager is unable to pay any attention and / or to provide medical treatment for any tourist who requires medical attention. Itinerary changes : We may operate more than one coach on a specified date of the tour depending upon the demand for more bookings of the tour by the tourists. Sometimes we may change the direction, or slightly modify the itinerary. We will advise you of these amendments prior to the commencement of the tour or otherwise during the tour. In the event of passenger / joining passenger misses out on any part of the sightseeing tour, or any such tour, due to delay on his part, he will not be entitled to claim refund for the same.